It’s been almost two months since I visited Pluck, but the meal I had there has stayed with me. 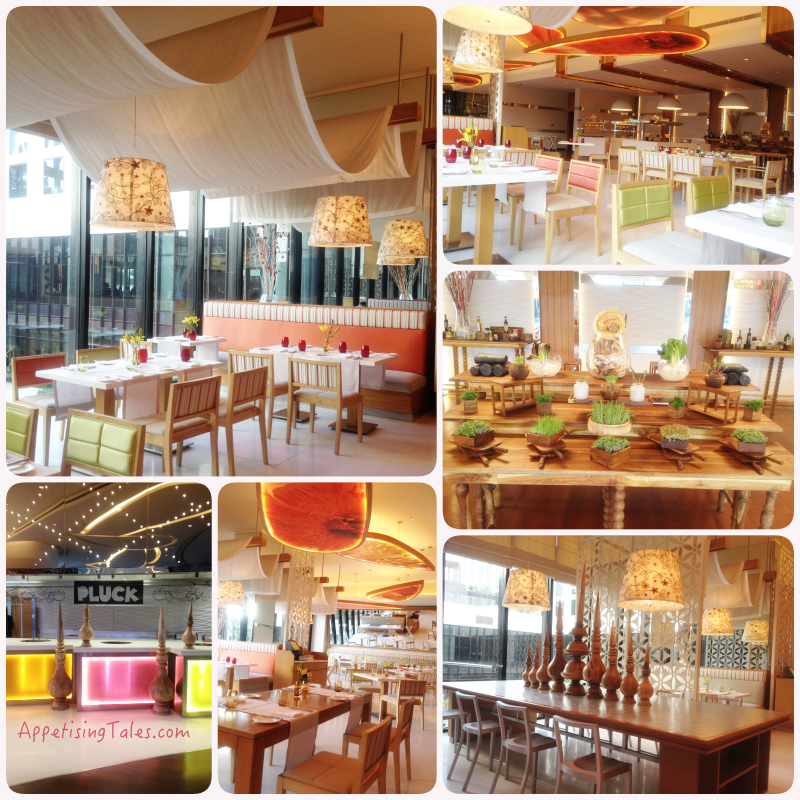 Here is a restaurant that serves each dish as beautifully as it is created. Pluck prides itself on offering farm to table food, a lot of which is literally plucked from the lavish kitchen garden at the hotel. Chef Ajay Anand, who was cruising around at the world as chef with Carnival Cruise Lines for fourteen years brings a delicious amalgamation of his experiences to the table. 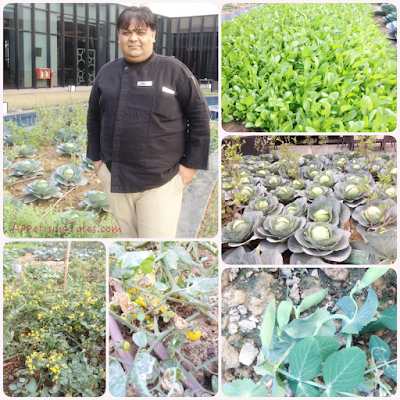 “Whenever I had the time, I learnt a plethora of authentic dishes and cooking techniques from seasoned chefs as well as homecooks in various European towns and cities,” he shares. He does draw extensively upon classic French traditions though. But the soul of his cooking comes from the use of the freshest ingredients possible – free range meats, organic and seasonal vegetables. I took the following pictures almost two months ago, but saw some recent pictures in which the garden is lush and flourishing. Chef Ajay Anand in his Kitchen Garden. The bright interiors let in ample daylight from the tall glass panels that look over a grassy courtyard. The modern architecture is softened by pastel shades and soft canopy-like drapes on the ceiling. In keeping with the theme of the restaurant there is an elaborate display of potted herbs as well. The amuse bouche sets the tone perfectly for the meal that follows. Japanese plum, compressed watermelon on top of cauliflower puree served with edible flowers on a wooden log is reminiscent of a garden in springtime. And instead of the usual bread basket, what you get is a bunch of fresh salad leaves with herb aioli. (When it arrived I wondered if it was just another decoration piece for the table!) These two on their own capture the essence of a meal at Pluck – all the dishes look beautiful and are quite light on stomach. 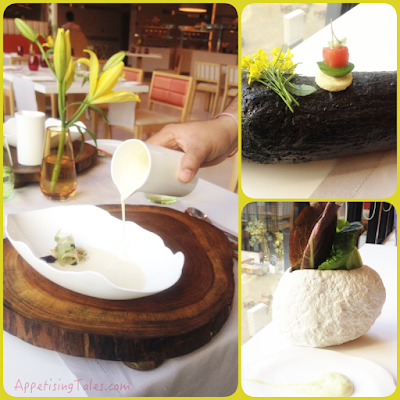 Then comes the Parmesan Burnt Garlic Soup with oatmeal strudel and roll over melba (Rs 600). Presented beautifully, it has a velvety creamy texture and a taste that lingers ever so mildly. And that oatmeal strudel that sits in the middle with some dehydrated cheese is absolutely delicious. Even though the other soups sound fab – Mushroom and Chestnut, with mushroom carpaccio and truffle mascarpone; Deconstructed Mulligatawny with coconut gel, puffed rice and lentil broth; and, Pine Roasted Red Pepper and Cherry Tomato – I would strongly recommend you try the one I had. I would go back someday just to have this soup. Right Bottom: Salad leaves with herb aioli. From the salads we go for a Light Spinach Salad with Mushrooms and blue cheese aioli (Rs 600). It also comes with crispy bacon, but we opt for the vegetarian version. While I appreciate the liberal helping of mushrooms, (I hate the fact that many restaurants scrimp on star ingredients in salads), the freshness of baby spinach really stands out in this one. 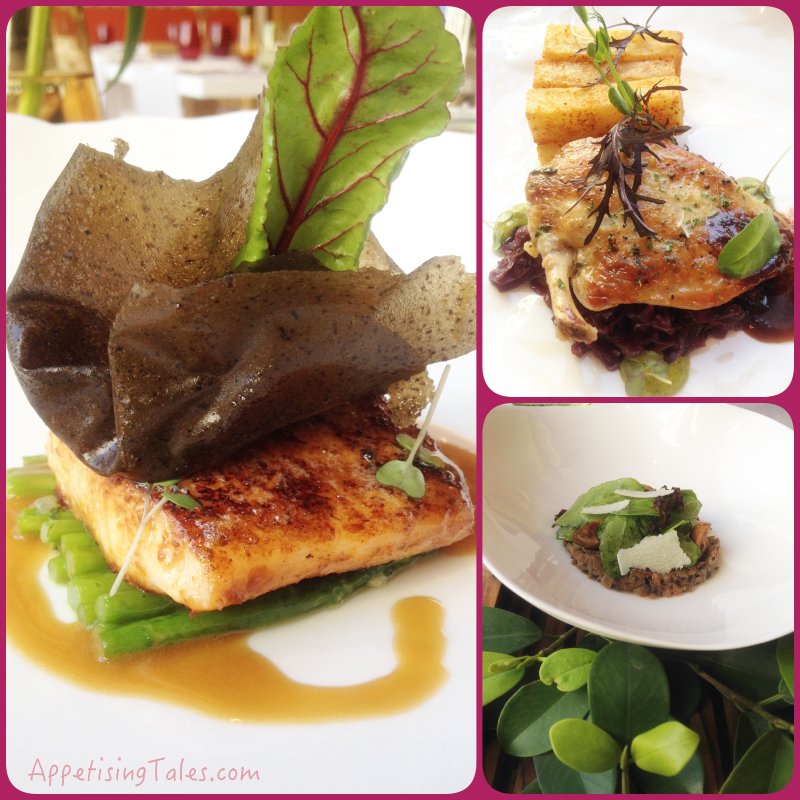 Then comes the Spicy Miso Salmon (Rs 1300) served on a bed of asparagus topped with a maple and olive crisp and a beetroot leaf. Chef Anand uses a lot of molecular gastronomic techniques, but going by the taste of his food, it is actually used to enhance the taste of each dish rather than merely dramatising the appearance. The salmon is marinaded and cooked sous vide before being grilled ensuring that the flavour permeates through each bite. And that paper-thin maple and olive crisp is crunchy, sticky and melts in the mouth. Grilled Chicken with Japanese seven spice, thick potato chips, herb aioli, braised red cabbage and morel jus is a great option too. We round up this fabulous meal with the Chef’s recommendation of Dark Milk Chocolate – milk chocolate mousse, dark caramel, candied macadamia nuts, warm malted caramel (Rs 500). Although it is filled with chocolatey goodness, it is a tad dense for my liking. Matcha Green Tea Custard with preserved lychee, and jasmine ice cream (Rs 500) sounds more promising though, as does the Yuzu Flan with caramelized banana, white chocolate mousse, champagne pearls and maple ice cream (Rs 500). Going by my spectacular experience, I would highly recommend you to try Pluck as soon as you can. 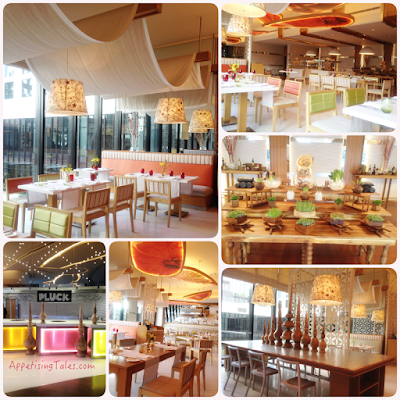 Sit back and enjoy the gastronomic extravaganza. Pluck - Pullman New Delhi Aerocity IGI Airport, New Delhi. Timings 12 noon - 3pm, 7pm – 11.30pm.